Contributors to the newspaper., “The Leader and The Kalkaskian, December 07, 1939,” Kalkaska County Library Local History Collection, accessed April 22, 2019, http://history.kalkaskalibrary.org/items/show/2360. Issue of "The Leader and The Kalkaskian" Newspaper. 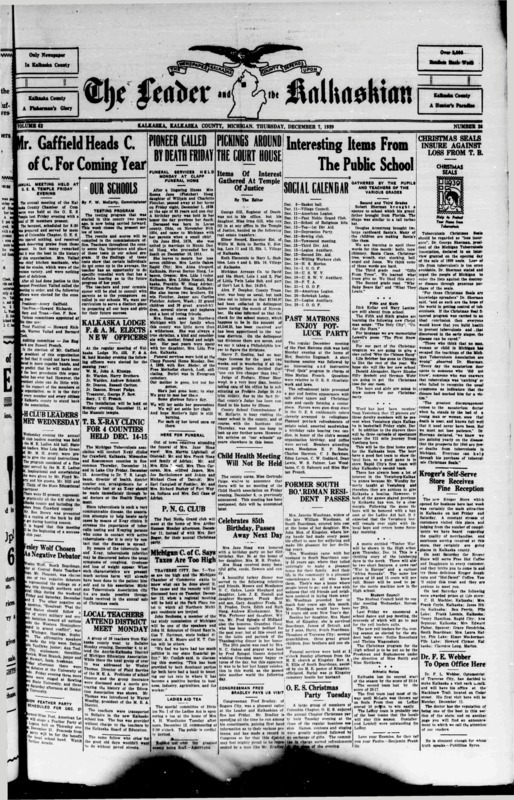 Microfilmed reproduction of this newspaper issue is held at the Kalkaska County Library, Kalkaska (Mich.). Excluding issues now in the public domain (1879-1924), Morning Star Publishing Company retains the copyright on the content of this newspaper. Depending on agreements made with writers and photographers, the creators of the content may still retain copyright. Please do not republish without permission.